These three photographs show Josephine Louise Barry (1910-1974) at various times in her life. 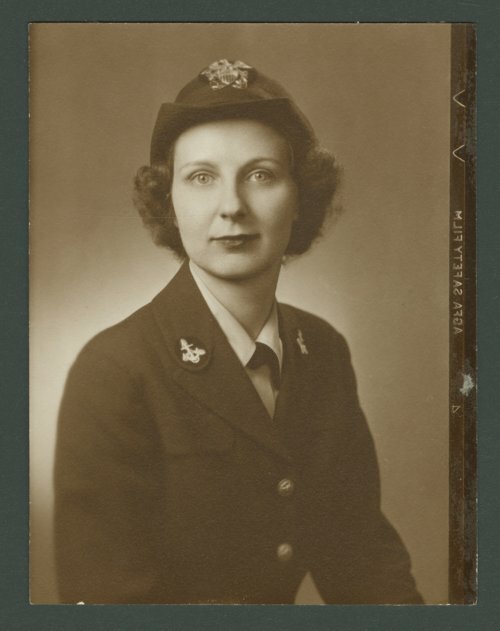 The first image shows Louise wearing a WAVES uniform during her service in World War II. The second image, possibly, shows her at the Kansas Historical Society in February 1939. The third image is a formal portrait of Louise taken in 1972. A librarian and indexer at the Kansas Historical Society from ,(1936-1974), she wrote a number of articles on Kansas and Western History. Louise is best known for "The Beginning of the West: Annals of the Kansas Gateway to the American West, 1540-1854." She also wrote numerous articles pertaining to the Santa Fe Trail.